12 April 1961, for the first time in human history, a man left the Earth and travelled in space. 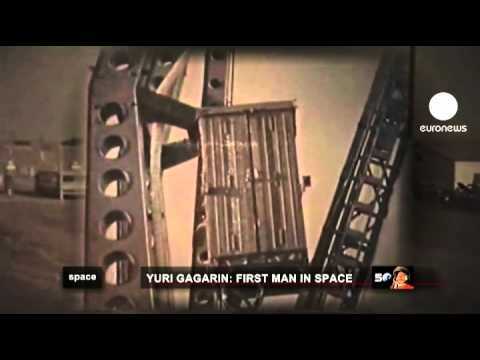 Who was Yuri Gagarin, how did that flight change his life and humanity? Find out in this special issue of Space. Alexey Leonov: “He invited us all into space”. Valery Lubinskiy: “He paved the way to the stars”. Elena Gagarina: “He opened a new chapter in the history of mankind”. The story begins in the village of Klushino, and the Gagarin family home. “My father, Yuri Alexeevich Gagarin, was born in a very simple peasant family. His parents worked on the collective farm and the family had four children. During the Second World war, there was an episode that Yuri often recalled: a Soviet pilot was shot down over their occupied village, and Yuri and other boys rescued the pilot and were hiding him from the Nazis, until a friend picked him up on another plane. This episode deeply influenced him, and from that time he really wanted to be a pilot, was eager to learn new devices and machines, and did everything to make sure that his dream would come true. So he entered military flight training at a pilot’s school and graduated with honors”. Gagarin did not seem at first to have the ‘Right Stuff’, with his irrepressible, irreverent personality. “Yuri and me, we had a reputation as light-headed pilots: during some lectures, we played battleships! Clearly, we were very much alike in our nature… Even now, when I close my eyes, I see his face – so Russian, so bright, his light brown hair, his big blue eyes shining like emeralds, and the smile, that immediate smile on his face”. “When home, my father was the same simple, charming, kind and cheerful man as he was known to other people. Whenever he could, he was giving us all his time – he read us books, helped us with our homework, he liked to take us to all kinds of trips… in short, he was such a animated person that it was pretty difficult for him to stay home”. The Vostok project marked the start of the manned flight space race, and the serious business began. “I was very lucky to be a part of the group that was designing the “Vostok” spacecraft. It was not just important engineers and scientists – they were true visionaries who believed that the manned exploration of Space and planets is their ultimate goal, and were eager to move in that direction”. “The cosmonaut was selected from a great number of volunteers, 3500 I think, all jet pilots. The top 20 passed initial training, then a group of six men was selected for the first division, and finally just the one, Yuri Gagarin, was chosen to make the first space flight”. The 12th of April 1961 was chosen as the day for the first human space flight, and final preparations began. “It’s like dressing a man in a suit and shoving him into a blast furnace, saying ‘fear not, the suit will protect you.’ But nobody knows for sure if it will actually protect you or not. It’s exactly the same thing here. ‘Don’t worry, everything will be fine, we just don’t know what exactly will it be – it’s up to you to tell us when your return’”. “It’s a known fact: the flight lasted 108 minutes. Nine minutes for the orbit insertion, then a single orbit around the Earth. Compared to modern achievements it seems – well, big deal, just one orbit – we now fly for months on the international space station. But it was the first time man flew into space, and that’s what Gagarin’s achievement is about. All he had to do was to make some radio conversations, try some food – he had the first space meals onboard. The goal was to see if a man can feel and act normally when weightless”. “He didn’t get to actually pilot the spacecraft, although he had all necessary controls to conduct a manual descent and landing in case the automation was unusable”. After the painstaking preparations for the mission little could have prepared anyone for the triumphant explosion of Gagarin’s return to earth. “All the people were truly, truly jubilant. In our design bureau we celebrated this joyful event massively”. “I went out in the center of Moscow and found it full of crowds – all dancing, singing, laughing. I asked, what is all the joy about? Girls ran by saying: ‘where have you been all this time? Gagarin returned from Space!’ And only then I realised the scale of what had happened. Until then it didn’t seem extraordinary – it was just work for us”. The flight would change the world, but it would also change Gagarin. His life would never be the same again. “I should say I even feel somewhat uncomfortable in front of my friends that my flight lasted only an hour 48 minutes. But this, of course, was only the beginning, only the first scouting of Space”. “Gagarin strove to fly again. He was training to pilot one of the first Soyuz spacecraft, he wanted to test that ship. And I think, if fate had been different, he would have made many more flights”. After taking such a dangerous leap into the unknown few could have expected Gagarin’s end to be so sudden and unexpected. When it came, it was a shock almost as great as his triumph. “Like all cosmonauts, Gagarin was dreaming about more space flights after his return. So he was training for that, and his exercises included piloting fighter jets”. “We thought he had ejected. We were searching for him all night – in vain. And only in the morning we found the fragments. And when I saw the birthmark, I said: no need to look any further. I know him”. “There were accusations, of course – how could the first cosmonaut be allowed to take such risks? But, as they say, eagles need to fly”. So what, exactly, is Gagarin’s legacy? How can his achievement be measured? “He was one of those who discovered a whole new world for us, for humanity”. “He was the exemplary man of that era – the model of his time”. The following people contributed to this special edition. It is their voices that tell the story. Alexey Leonov is a Soviet cosmonaut, the first human to conduct a space walk, and a friend of Yuri Gagarin. Valeriy Lubinskiy was the Chief Scientist, RSC Energia and the Spacecraft Design Engineer for Vostok-1. Elena Gagarina is Gagarin’s daughter and the General Director of Moscow Kremlin Museums. Yury Usachov was the Head of department at the Flight test center, RSC Energia and a Test Cosmonaut Instructor. Pavel Vinogradov was Deputy Head of the Flight test center, RSC Energia, and also a Test Cosmonaut Instructor.